A solid which is isotropic with respect to coordinate rotations but not with respect to inversions is called noncentrosymmetric, acentric, hemitropic, or chiral. Chirality (hemitropy) has no effect upon the classical elastic modulus tensor. In Cosserat elasticity, chirality has an effect. Asymmetric stress is allowed in Cosserat solids. A chiral or hemitropic micropolar cylindrical rod is predicted to undergo torsional deformation when subjected to tensile load, so a chiral material will twist when stretched. Classical elasticity cannot account for such phenomena. These concepts lay the groundwork for chiral metamaterials or chiral architectured materials or chiral architected materials; we did not use such terminology. Use of 3D printing facilitates making such materials. The theoretical groundwork for chiral elastic materials was developed here. R. S. Lakes and R. Benedict, Noncentrosymmetry in Micropolar Elasticity, International Journal of Engineering Science, 20 (10), 1161-1167, (1982). R. S. Lakes, Is bone elastically noncentrosymmetric?, Proc. 34th ACEMB. Houston (1981). This is likely the first observation of elastic chirality in a material. Lakes, R. S., "Elastic and viscoelastic behaviour of chiral materials", Int. J. of Mechanical Sciences, 43, 1579-1589, June (2001). Chiral materials are not invariant to inversions: there is a distinction between right and left handed material. Material properties such as piezoelectricity and pyroelectricity, represented by tensors of odd rank, can only occur in chiral materials. Chiral effects in elasticity cannot be expressed within classical elasticity since the modulus tensor, which is fourth rank, is unchanged under an inversion. We consider effects of chirality in elastic materials described by a generalized continuum representation, specifically Cosserat elasticity. Analysis of several configurations discloses a chiral material to generate reaction moments when compressed as a slab. A chiral plate bent to hyperbolic shape is predicted to exhibit size effects from the Cosserat characteristic length, and a shear force from the chirality. This analysis can be used for the interpretation of experiments on compliant chiral materials, in particular the evaluation of the elastic constants. Viscoelastic chiral solids are examined in the context of the correspondence principle. Chiral solids exhibit stretch twist coupling. Download pdf here. Ha, C. S., Plesha, M. E., Lakes, R. S., "Chiral three dimensional lattices with tunable Poisson's ratio, Smart Materials and Structures, 25, 054005 (6pp) (2016). Chiral three dimensional cubic lattices are developed with rigid cubical nodules and analyzed via finite element analysis. The lattices exhibit geometry dependent Poisson's ratio that can be tuned to negative values. 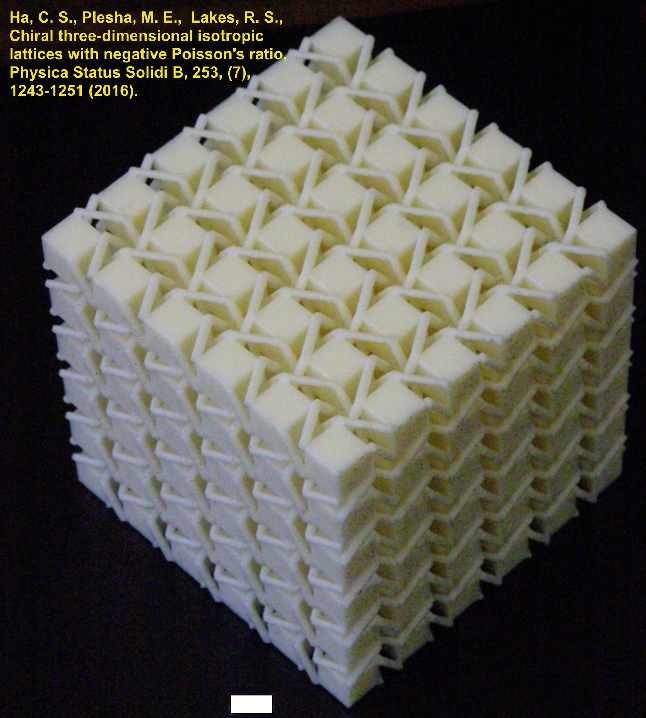 Poisson's ratio tends to zero as the cubes become further apart. The lattices exhibit stretch twist coupling. Such coupling cannot occur in a classical elastic continuum but it can occur in a chiral Cosserat solid. Chiral three-dimensional isotropic cubic lattices with rigid cubical nodules and multiple deformable ribs are developed and analyzed via finite element analysis. The lattices exhibit geometry dependent Poisson's ratio that can be tuned to negative values. Poisson's ratio decreases from positive to negative values as the number of cells increases. Isotropy is obtained by adjustment of aspect ratio. The lattices exhibit significant size effects. Such a phenomenon cannot occur in a classical elastic continuum but it can occur in a Cosserat solid. The material exhibits squeeze-twist coupling and stretch-twist coupling. This is the first three-dimensional metamaterial that is chiral; we did not call it by such a name. Chiral structures have been observed in trees by Professor Cherkaev of the Mathematics Department at the University of Utah.